Before being given free range (in the barn, at least), the lambs go through a couple of procedures that seem more labour intensive than others. This is basically because the same thing has to be done to 300+ lambs. The first of these procedures is injecting them with antibiotics. The lambs are corralled in a very confined space, in this case by Nadine and myself, while doctor/farmer Luc grabs each lamb in turn and sticks a needle in its neck. The needle is fed via a plastic tube from a bottle of antibiotic in Luc’s pocket. Every now and then, Luc changes the needle. 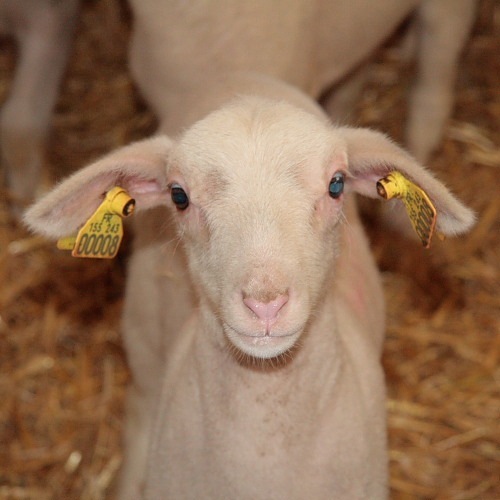 The second procedure involves giving each lamb a splendid set of yellow earrings. The earrings act as identification bearing the number of the lamb’s mother and a number for the lamb itself. Nadine prepares the ear tags with the numbers and antiseptic cream before loading them on plier-like devices and handing them to Luc. Luc deftly pierces their ears and all is well. The lambs are now inoculated and identified and can be mixed together. Various other medical practices are employed on an as-required basis. Today, doctor/farmer/pedicurist Luc gave one lame ewe some foot treatment. We’d seen her hobbling for a day or two and it was time to take corrective action. Using something resembling tin-snips, Luc first clipped the ewe’s hoofs before discovering an infected area on one foot and cleaning it out. We wait to see what the result will be. Rather more disturbing was the appearance of a small angle-grinder in the bergerie (sheep-fold). It looked as if less-than-subtle butchery was about to commence. Fortunately first impressions were wrong. Some time ago a ewe had sustained a broken leg which Luc had set with a wooden splint and plaster of Paris. Now it was time to remove the plaster and see if the ewe’s leg had mended. While Nadine and I took a firm hold of the poor ewe, Luc proceeded to cut through the plaster using the angle-grinder. After a few minutes of industrial surgery, doctor/farmer/pedicurist/surgeon Luc succeeded both in filling the bergerie with fine dust and removing said plaster. The indignant ewe hobbled away, mended and getting stronger with every step. I never imagined the variety of tasks that sheep farmers would be called upon to do would be so great or so apparently far removed from farming. All this medical effort is so that we end up with healthy, cute little characters like this, though it is best not to think of what will become of them or when. Oh, and if that weren’t enough, the poor ewe that suffered from a prolapsed uterus and that Luc treated is still with us, today, at least.